Eagle-eyed viewers of Only Connect will, I’m sure, have noticed that I was wearing a particularly delightful necklace on this week’s episode. It was made by the makeup designer on the show, Juliet Ireland. 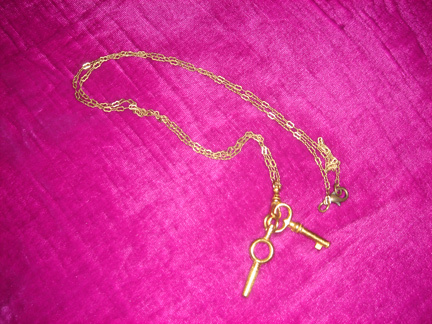 Juliet makes necklaces out of little Victorian keys that she picks up on her travels. Wait, wait, that sounds like she steals them. I’d take the key to your door anytime. Ahh, i have to say, during the wall round i noticed that beautiful necklace (albeit because i was completely lost in connections & red herrings galore) & i also made a mental note to try & find out where it was from, does Juliet have a website to peruse at all? Hi Rebecca. I don’t think Juliet does have a website, because professionally she’s a makeup artist and the jewellery-making is just a hobby really. But if you drop her a line at that email address I’m sure she can send you some pictures - or at the very least have a chat and swap some descriptions, she can make key-necklaces pretty much to order. I have not watched the 2nd part of Only Connect yet. I have it waiting for my attention on my PVR. But now you have mentioned the Victorian necklace you are wearing on the show I will have the info about it already. The necklace looks very nice and thank you for letting us know about the maker. Just to point out that I’m sure there are men out there, such as myself, who would love to wear these necklaces just as much as women would. Fair point, Clyde! Absolutely men could wear it as well. Just to point out to Clyde..
What a shameless plug! Take it easy on the fags’n booze there VC! Hmm. There’s something between the lines of that last post that I’m sensing but not quite getting. If you boys are a couple, then for heavens’ sake BUY CLYDE THE NECKLACE or you are a rubbish boyfriend. ‘Oh Behave!’ VC you’re a MissChief and no mistake! I’ve ‘got your number’ but know better than to ever call! “Now then young man, what would you like for your 4th birthday? These are very nice, however, I was quite taken with your teacup necklace I noticed in one of the Only Connect repeats a few weeks ago. Where do you get one of those? My other half would rather like one! Ah, well that lovely teacup necklace was a present - bought, I believe, from a stall in Borough Market in Hackney. Ta love! I’ll keep an eye out next time I’m in that London. Vicky, it’s absolutely lovely of you to support your friend with this plug. Hopefully she’ll get more orders than a naughty soldier and get to turn her hobby into something more financially tangible. I’m going to buy one when pay day hits.